In 1984, Mark Fritz and Mike Hutchinson started Lakeshirts in the basement of Mark's parents' home printing shirts to sell on the beach. 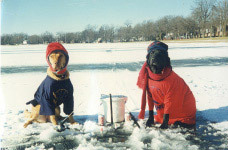 Their dogs accompanied them at work each day. They built their first building, which they've expanded five times over two and a half decades. 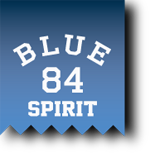 Introduced Blue 84 Spirit to elementary and high school markets. Annual sales over $50 million, shipping 30,000 units per day for 2,500 customers. 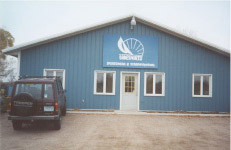 Business established on the shores of Detroit Lake in northern Minnesota selling screenprinted garments to colleges, businesses and resorts. Added Doghouse Dyeworks, Inc. to dye their own shirts. Introduced Blue84 College to the collegiate market. 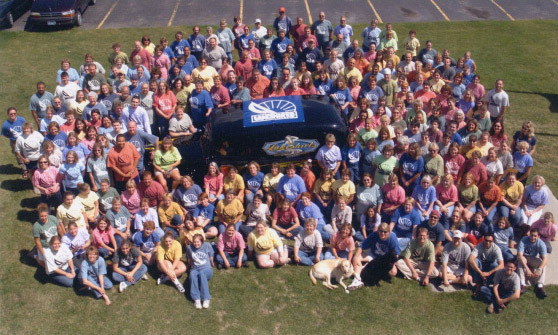 Blue 84 by Lakeshirts currently employs nearly 400 people in Detroit Lakes, MN; has 80 sales representatives nationwide; stocks over 100 different body styles; and it's team of 35 trend-watching artists add over 8,000 designs a year to the great offering. In addition to elementary and high schools, you can find Blue 84 apparel in fan shops, colleges, sporting goods stores, resorts and bookstores around the country. Blue 84's facility is still pet friendly, with dogs accompanying employees to work each day.